Have you ever wondered how indigo from India, colored the fabric in Europe? Or how the silk from China, spices from India, precious stones from Egypt, dominated the word? The availability of commodities at our doorsteps often restricts our imagination of how exactly the product is reached from say Argentina to Sri Lanka, especially after globalization. Ancient Trading Routes, is where it all started. The first stone for what we call today Globalization, was paved in ancient times itself. 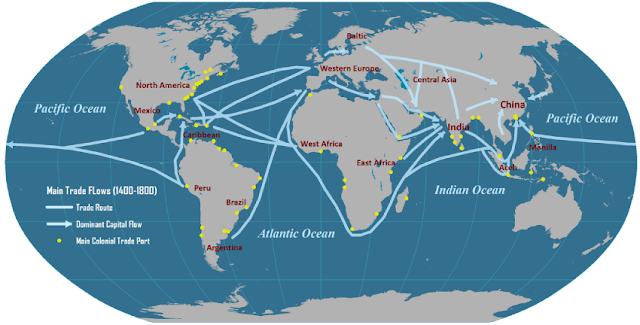 Here are Top 5 Ancient Trading Routes, of the world. This is probably the word came to your mind after listening to the word trading route. It was the most famous and important trading route of the World. Known as one of the first trading routes in the world to join East and the West, Silk route stretches from China with India, the Middle East and Europe all through Central Asia. It passes through the Kingdom of Ottoman Empire, Constantinople, which was referred to as gateway for the East from West. The silk route not only expanded the transport services to and from East to West for goods, but also for technology, religion, and culture. Monks from India and China started travelling West, via various transportation methods, and the Portuguese found a new route to explore the new world, The East. As the name goes, Silk was traded from China to the Roman empire, in exchange for wool, silver, and gold in return. The route covered roadways from China, alongside the great wall, all the way to Afghanistan, where the goods were loaded on the ships and sea route was taken. Business was booming in both the sides of the world and hence, it became the most important route of the trading history. The essence of incense, flowed from Saudi Arabia to the Mediterranean. The raw material needed for the production of incense back then, was exclusively found in the southern part of the Arabian Peninsula. Apparently, the material needs to be dried up in the sun and controlled in a hot weather to be processed further for producing incense. The processed material was then loaded up in the domesticated camel and transported to the port areas, to be sent up further via the sea route. The transport may take days, but the revenue that the locals were generating are way beyond their expectations. The route tied to India also in the coming years. Incense production in India was also an old art and the availability of spices boosted the economy. Among the important materials used for trade and business in market, precious stones were also a part of it. The stones, extracted from older tombs, or from excavation, were sold at a remarkably higher price in the alien land. Not only stones but other goods included souvenirs like swords, crowns etc. as well. One of the most important trade route of the Indian history and probably the most important heritage of the Indian peninsula. Ranging from Chittagong in Bangladesh all the way up to Kabul in Afghanistan, the route was the lifeline of the Indian Peninsula. Dating back to as far as the 3rd Century BC, during the Mauryan Empire, the traces of existance of the route can be found. Historians believe that during Mauryan time the route extended from the mouth of the Ganges to the north-western frontier of the Empire. It was however reconstructed and extended in both the ends by Sher Shah Suri. This was completely overland route and often people travelled in ponies and use the ponies for transport services as well. What else can be said in the glory of the Grand Trunk Road, that it exists till today and is one of the most important route of the present-day transport services. Truckloads of parcels are moved and delivered by the movers and packers in the Northers part of India today, using the Grand Trunk Road. Indian spices were one of the best in the world. When the west tasted the spices, they fell in love with that and kept searching for the land of Spices, until they day they arrived Kerala. The Portuguese followed by the Dutch, were among the first to set foot in Coromondal coast and conquered Kochi. The Pepper and cardamom produced in Kerala is the best in the world. The westerners didn’t lose the opportunity and quickly established a trade route for the spices extending the preexisting Silk Route and Incense Route. Due to its strategic location, the town of Idukki and Kochi, quickly started gaining revenue from the spices they grew. It was located in the bank of the ocean and transportation services from the ship was easy. It opened a gateway for the Europe to obtain spices. Technically the Spice route was not a dedicated route only for transportation of spice but it was more of a node of the network of the trade route already existing. The only thing is, this particular node was explicitly for spices and goods related to it. The transportation services used were merchant ships and sometimes the Royal Navy Ships as well. The accumulation of amber was very high in the Northern Europe. It had several deposit points which were extracted and transported to far lands. Amber was shiny material which was very light in weight but was regularly in high demand in far lands for its use mainly in making of ornaments and sometimes in science experiments as well. Amber route connects Northern Europe to the Mediterranean. Important countries connected via this route are Germany, Switzerland, Netherlands, Belgium, France, Spain, etc. Basically, formed billions of years ago, the Amber is obtained from the seas shore, when they are washed away by the hurricanes. Its demand in the market was ever growing. It was transported from the Baltic sea via land. The transporters used mainly horse carts, personal ponies and horses. Most of these routes are still in use today and the land routes are covered by the truck services mostly. In a way, trucks and freight transportation are what keeping the old soul and the heritage of the glorious past alive. No Comment to " Top 5 Ancient Trading Routes of The World "